Imported from Mexico, Barron Rojo 184/09 is one of the most consistent producing bulls of uniform, big ribbed, heavy muscled, easy fleshing, fast growing and low birth weight calves. Breed with confidence to a wide variety of cows. He is one of the top sons of VL Rojo Designer 10/9 born and raised in Mexico by Ranch K30. VL Rojo Designer 10/9 was the true definition of a “Red Brahman Bull”. He exemplified masculinity, breed character, and performance. 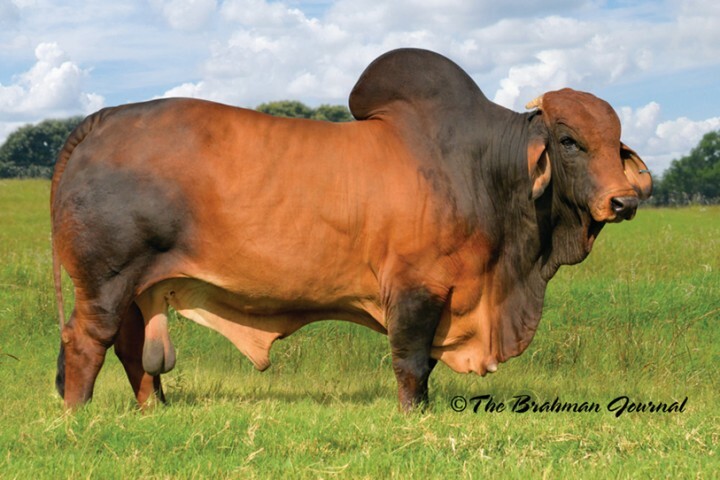 He was an extremely well made, balanced bull with impressive muscle and eye appeal. His dam is goes back to +Mr. 3X He’s Got the Look 40/2. Baron Rojo was the Grand Champion Red Bull at the XLIX Exposición Nacional de Ganado Cebú Tabasco Mexico in 2012. Baron Rojo calves are small at birth, very smooth shouldered and extremely correct. His calves were always the top prospects in our calf crop. We recommend using him on larger frame cows to add balance and conformation.